Got a favorite set of wheels when it comes to Super Mario Kart? Of course you do. It's pink, it's got a crown printed it on the hood, and it's got a big, souped-up exhaust. And all of that means something pretty darn important too. That you've also got a favorite driver. Yep, we're talking about Princess Peach here, obviously, and we're also talking about her themed pink racer. And we're also talking about just what you can do when you pick up the controller and wheel her to the finish line! But now there's a brand new way to pilot Peach's racer. It's by becoming the princess herself! 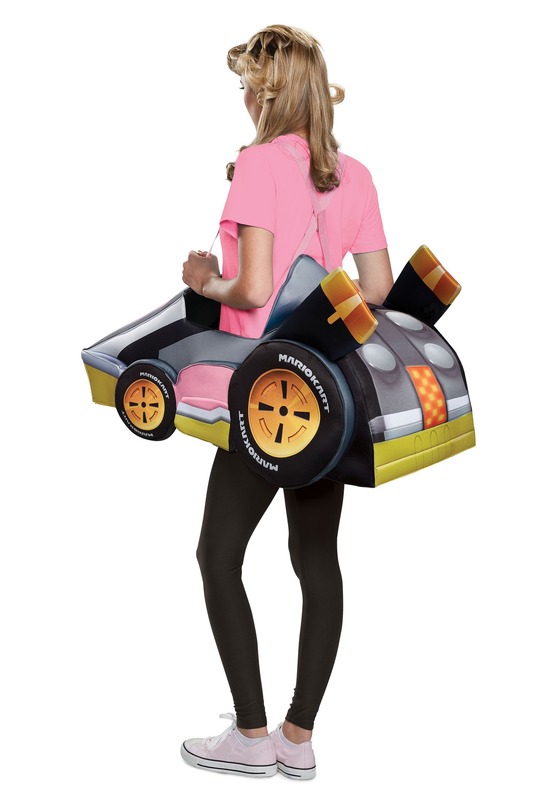 That's right, with this adult Super Mario Kart Princess Peach ride-in costume you'll be ready for a little vroom vroom. And a whole lot of fun. And you'll definitely be ready for the Winner's Circle! This Princess Peach ride-in costume is a simple costume accessory that's easy to wear. A polyfoam “kart” is attached to suspenders, and when you wear it gives you the appearance of being the driver. Printed details and graphics provide the finishing touches like the crown logo on the hood and Mario Kart branded tires. 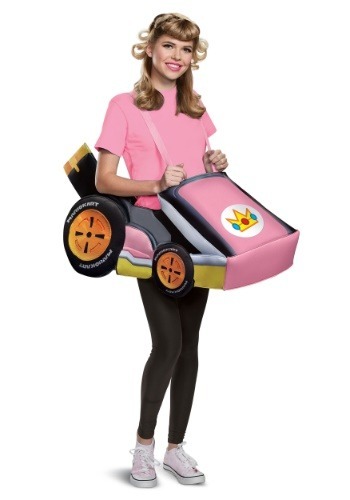 You can wear this Mario Kart ride-in costume with a Princess Peach costume or just wear your favorite pink T-shirt like we have it pictured! Don't hesitate to show your video game prowess out in the real world when you choose This Woman's Mario Kart costume. You've always wanted to be a princess, after all, so you might as well be Princess Peach and show off that you know how to put the pedal to the metal!